← Hazel Cunningham – It’s Your Time to Shine! 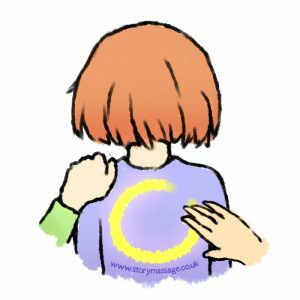 We have been so delighted to hear feedback about the many benefits of Story Massage for children with autism. Benefits include relaxation, touch tolerance, emotional regulation, increased concentration, better sleep and social connection. Here is a collection of some of the reported benefits of Story Massage for children on the autistic spectrum. At Kiladangan National School in Tipperary, Story Massage was introduced by Holistic Therapist, Melanie Kelly and is now part the Literacy Curriculum for children with autism. Going back to class after lunchtime play can be difficult for many children, especially those with autism. At Woodbank Special School in Halifax, Story Massage is now being used to help children relax and regulate their emotions so they are ready for learning. Autistic children can experience a high base level of anxiety every day. And unexpected events can escalate their anxiety so that it becomes overwhelming and may lead to challenging behaviour. Many children with autism tend to work individually and can be averse to giving and receiving touch. 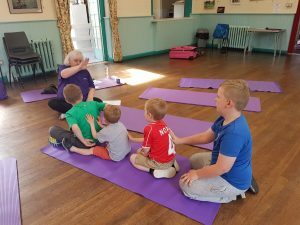 Story Massage was introduced to a group of 14 autistic children, both girls and boys, at Orchard Primary School in Wisham to see if to see if it would encourage social interaction through peer massage – and it did. Children can find it challenging to cope with any change – and starting a new class away from home and familiar surrounding can be particularly difficult. 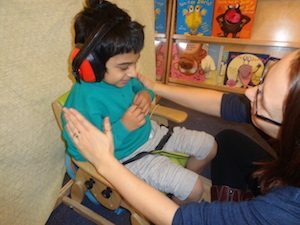 Staff at The Snowflake Centre, based in New Bridge Nursery School in Reading, use Story Massage for children with autism to prepare them for mainstream nursery and mainstream school. But it is not just about preparing for transition to a new school or class. Social stories combined with the ten basic Story Massage strokes are now widely used to prepare children for any change to their usual routine and help them make sense of the world around them. The combination of story and massage techniques can be very effective in coping with challenging behaviour, says Katrina Payne, a Sensory Therapist working with a range of clients with additional needs.”Story Massage offers the distraction of creativity and use of the child’s imagination, ” One example of this is where a child initially only wanted ‘scratching’ on his skin, he was constantly scratching his own skin. 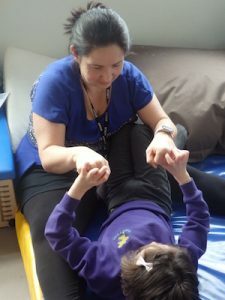 At Westfield Special School in Leominster, Story Massage is now a regular part of the daily routine as it had made such a positive difference to the children. Nicky Morris, Class Teacher in Hedgehog Class, says that helping one boy to sleep at night has made such a huge difference to the whole family that she would list improved sleep as a key benefit. 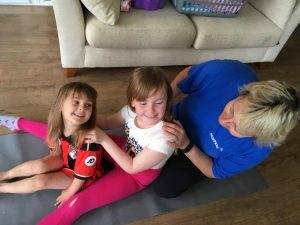 Nicky Morris runs regular Story Massage sessions in class and encourages parents to continue at home. “This particular boy was having real problems with sleep, but with a regular massage story at bedtime from his parents, he is more relaxed and is now sleeping through the night,” says Nicky. Story Massage combines the benefits of positive touch with the creativity of storytelling. Ten massage strokes form the basis of the Story Massage programme. These strokes have a simple such as The Circle or The Sprinkle, and an easy to recognise symbol making it fully accessible for all ages and abilities. Are you inspired by the benefits of Story Massage for children with autism? Would you like to train to use Story Massage in your work or home? We run a popular one day accredited training course that is held around the country for individuals and groups. On these days we teach you how to share the ten Story Massage strokes and work with you to adapt familiar stories and even create some sensory stories of your own. Ideal for therapists, Early Years practitioners, teachers, those working with people with additional needs, Relax Kids coaches… everyone with an interest in sharing positive touch activities with children. We also offer in-house training options. All the information is here: Story Massage Training.